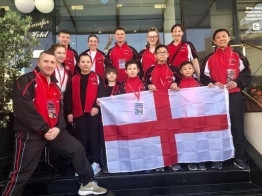 A massive congratulations to the Elite Squad who competed at the European Championships in Malta this October. 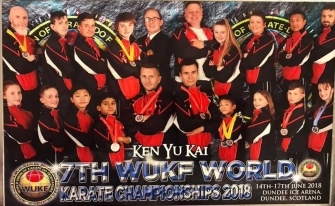 The squad brought home 2 GOLD, 2 SILVER & 4 BRONZE, did both Ken Yu Kai and their clubs proud. With many of them finishing in the top 10 of their sections, they all competed galliantly in this very high profile competition. 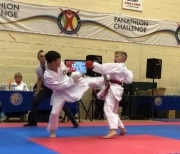 GOLD for Kieran Leano(1st Kyu - Langworthy KYK) in the Boys KATA 9 years section. 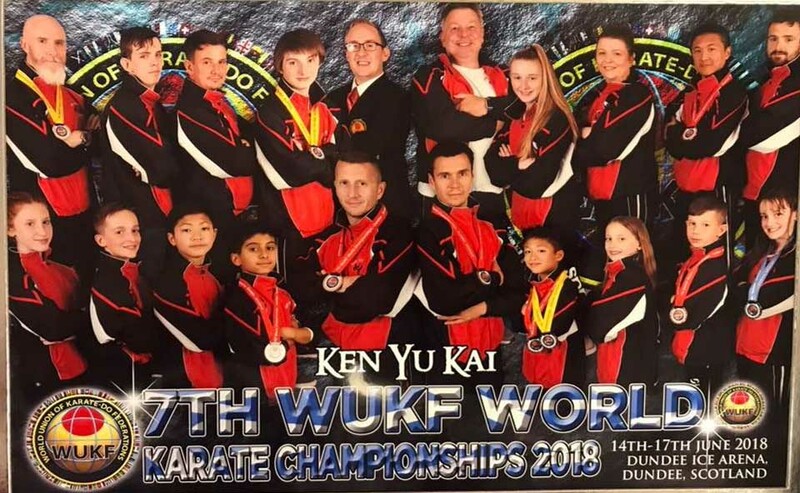 With a 18 strong team, Ken Yu Kai was perhaps one of the smallest squads in attendance at the World Championships this time. With representatives from a number of our clubs across Manchester, we brought home a very respectable 3 GOLD, 3 SILVER & 3 BRONZE. Out of 84 associations from across 41 different countries, we finished 24th on the medal table. A huge congratulations to everyone that competed - you did yourselves and your club immensely proud. Click here for more information. 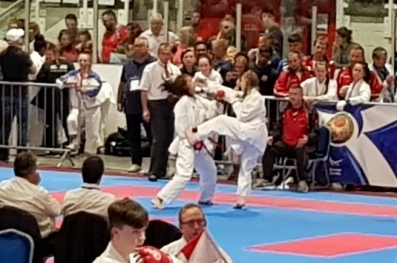 World Karate Championships in Dundee, Scotland. Our competitors of 18 consisted of Sensei William Pope (5th Dan - Head Squad Coach & Chief Instructor at Langworthy), Sensei Chris Baker (6th Dan - Chief Instructor at Prestwich), Sensei Ste Surtees (7th Dan - Langworthy), Sensei Oli Hampson (2nd Dan - Instructor at Failsworth & Droylsden), Keith Leano (1st Dan - Langworthy), Daniel Kinsey (2nd Dan - Eccles), Demi Pope (2nd Dan - Langworthy), Karl Boyd (1st Dan - Eccles), Nathan French (1st Dan - Prestwich), Phoebe Murphy (1st Dan - St Margaret's), Kenneth Leano (1st Dan - Langworthy), Danny Caldwell (1st Dan - Langworthy), Archie Caldwell (1st Dan - Langworthy), Maddison Williams (1st Kyu - GKKC), Keiran Leano (2nd Kyu - Langworthy), Niamh Hill (2nd Kyu - Failsworth), Samantha Kinsey (3rd Kyu - Eccles) & Mardin Rostamzada (4th Kyu - Broughton). 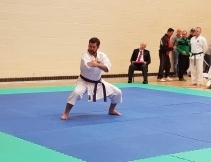 A special thank you to Sensei Jack Fletcher (2nd Dan, Chief Instructor at Broughton) who refereed throughout the Championships, along with Sensei Hollie Frith (2nd Dan, Instructor at Broughton) for working as a Table Official. An additional thank you goes to Sensei Will Pope, Sensei Chris Baker & Peter Kinsey for coaching the squad throughout the Championships. 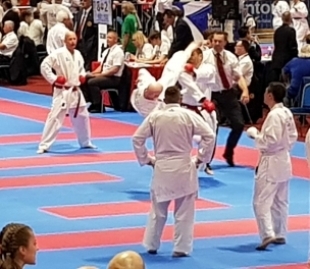 All of our Kata competitors all finished in the top six of their individual sections - Sensei Chris Baker: 4th Place, Kenneth Leano: 4th Place, Daniel Kinsey: 5th Place, Maddison Williams: 5th Place & Nathan French: 6th Place. Some of our fighters were unlucky and didn't get through their 1st rounds, but all fought with gusto and found the experience invaluable. Others went through into 2nd rounds and lost out on medals. Huge congratulations to you all. 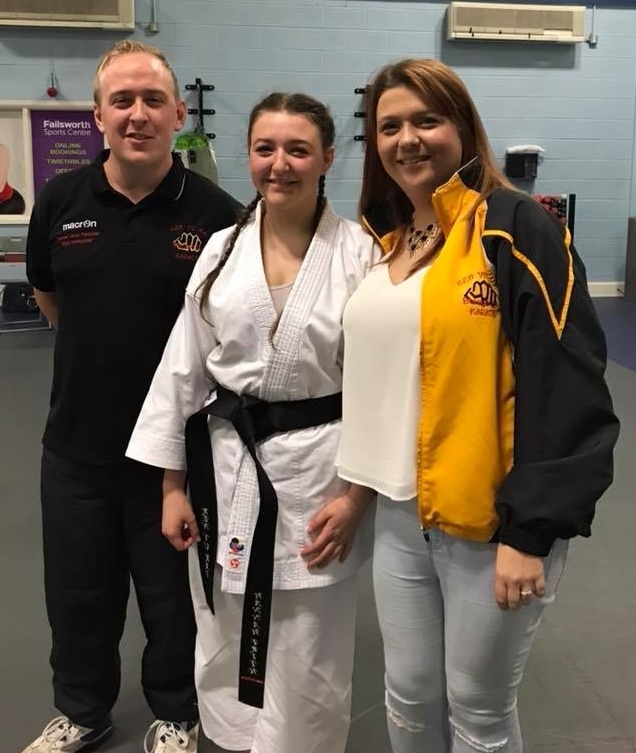 Including those above; our fighters were: Niamh Hill (2nd Kyu - Failsworth, Mardin Rostamzada (4th Kyu - Broughton), Archie Caldwell (1st Dan - Langworthy), Danny Caldwell (1st Dan - Langworthy), Will Pope (5th Dan - Langworthy), Keith Leano (1st Dan - Langworthy), Demi Pope (2nd Dan - Langworthy). 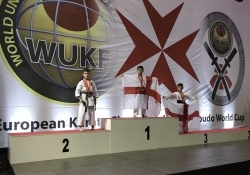 On the 29th April, Ken Yu Kai took part in 3 different competitions in one day across the UK. 4 GOLD, 8 SILVER & 7 BRONZE. Click on the location for more details. 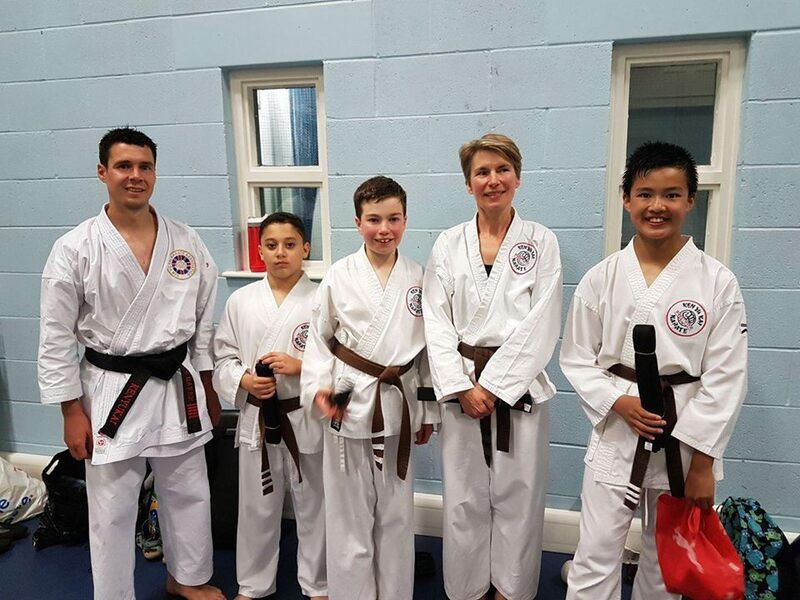 We can now boast 7 new Dan grades including a new 6th Dan, one 2nd Dan and five 1st Dans, plus 6 that passed their assessment and will take the Dan grades with the next 12 months. A huge congratulations to you all. Click here for the full story. Ken Yu Kai is able to boast about it's new Dan Grades. 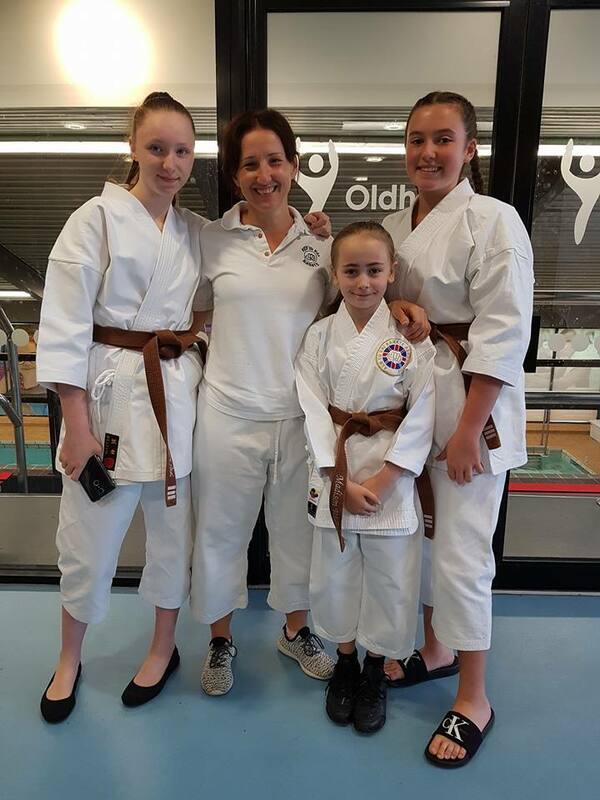 After a long 5 hours (including a 2 hour hour course), we now have a new 6th Dan - Sensei Chris Baker (6th Dan - Chief Instructor - Prestwich KYK), Sensei Oli Hampson (2nd Dan Instructor at Failsworth & Droylsden), and five 1st Dans - Hannah Frith (1st Dan - Broughton), Leonard Tsai (1st Dan - Prestwich), Mandy Moore (1st Dan - Prestwich), Jack Moore (1st Dan - Prestwich) & Kalil Aboreal (1st Dan - Prestwich). Taking their assessments this time were 1st Kyus Lee Price (Failsworth), Brian (Droylsden), Myles Turner (St Margaret's), Madison Williams (GKKC), Chloe Cope (GKKC) & Remy Ainley (GKKC). 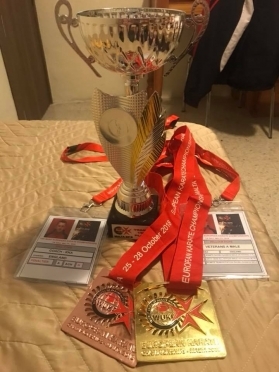 was able to bring home 3 Gold, 6 Silver, 6 Bronze overall. Well done to all our medal winners and all thosethat took part. For photos click here. 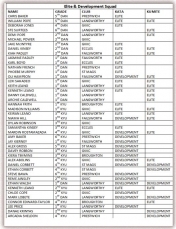 New Elite & Development Squad has been selected. 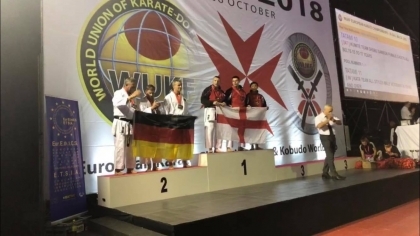 The new 2018 Elite and Development Squad has been selected for forthcoming competitions, including the WUKF World Championships that take place this June in Dundee, Scotland. If selected, there is an expectation that you attend all the squad training sessions and a number of the competitions that have been chosen for you to compete (see full diary for details); some of them compulsory. You will be informed in due course of the above. 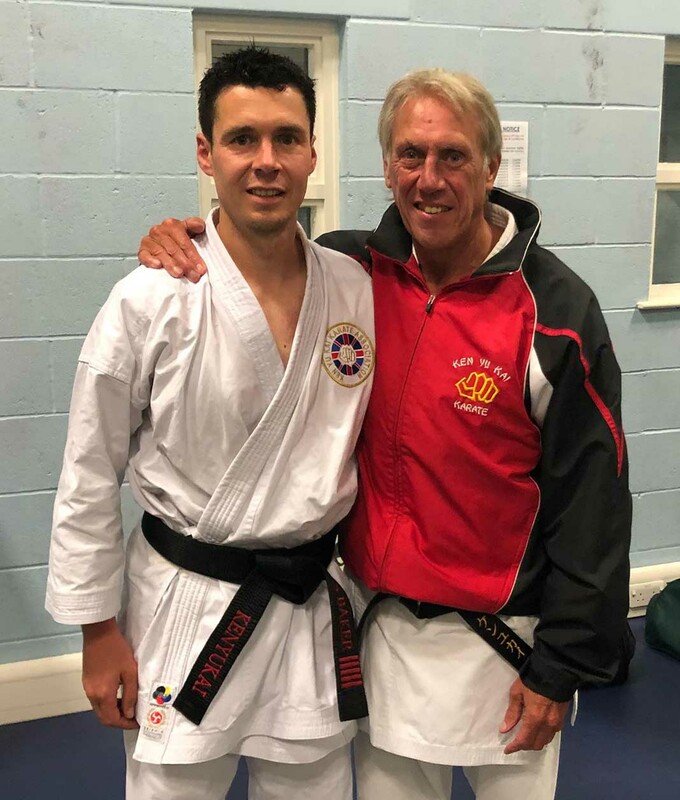 With many attendees from different Ken Yu Kai clubs from across the region, the course led by Sensei Terry Pottage (8th Dan - Chief Instructor & Head of the Ken Yu Kai Association) proved to be a worth while session for those expecting to take their Dan grades and assessments at the end of May. Thank you to all the Senseis that assisted through out the course. 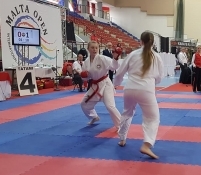 Head Squad Coach Sensei Will Pope (5th Dan, Langworthy), along with Sensei Deborah Jones (4th Dan, GKKC) took a 13 strong squad over to Malta to compete at the Malta Open in March 2018. The highly prestigious competition saw us bring home 3 GOLD, 5 SILVER & 6 BRONZE. A huge congratulations to everyone who competed and well done to our medal winners. Ken Yu Kai at the WUKF World Karate Championships 2016 in Dublin. This was the largest team we have ever taken to an International competition. With 22 competitors, we came away with 2 Golds,1 Silver and number of 10 placements. 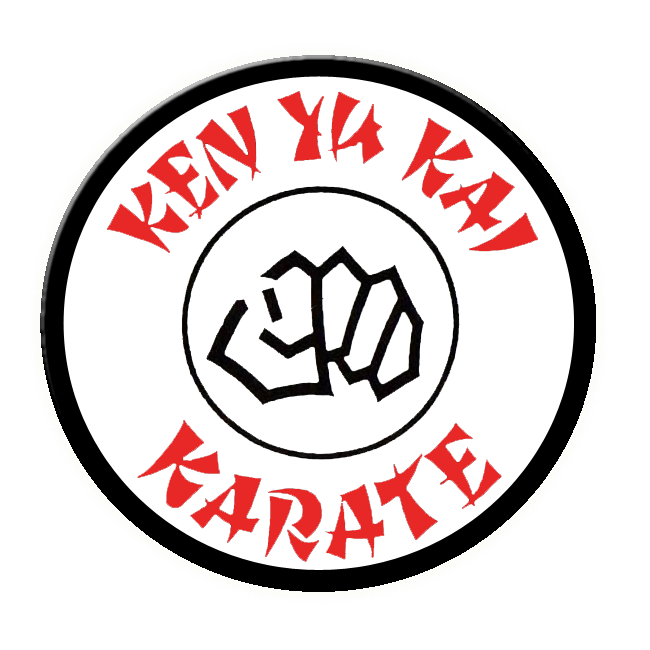 Well done to all Elite Squad, you did Ken Yu Kai very proud. 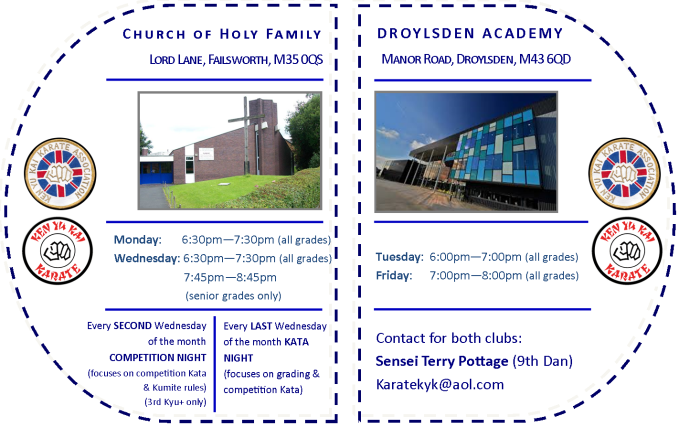 For more photographs of the grading, please visit our Failsworth & Droylsden Club photos page.